There’s nothing fun about going through chemotherapy, the treatment that’s used to destroy cancer cells. It’s a constant cycle of going to appointments, getting your blood drawn, accessing your port and having meds delivered into your body. Some chemo sessions last half an hour, while others can take as long as four hours. Most cycles range from two to six weeks, while others can last from four to six months. Then there are the side effects of chemo, like experiencing chemo brain (being unable to remember things), hair loss, nausea and fatigue. In other words, chemo isn’t something to look forward to, and these memes show the honest reality of what it’s like to be in treatment. When posting on instagram cancer survivors show all their power, resilience and how they resist all the pain they suffer. To appear authentic they give insights into their dark moments of fear, pain and suffering. But that’s mostly physical issues and death fear. What people don’t like to talk about is chemobrain. No doubt chemo affects your brain cells. Certain ones can pass the blood brain barrier and cause irreversible damage. Cisplatin is the most popular one causing these side effects. Chemobrain causes us to forget things we already said, makes remembering a real challenge… I for example got only little memory of the life before cancer. Seriously there’s not much I can remember in detail. Furthermore my body is sensitive to stress. Any pressure causes me to get nervous and start sweating immediately. Worst thing to me is still the memory and functionality of the brain. Whereas in the past I could have read a scientific text a few Times and remember almost all details, now I need to reread every complex phrase to get a grasp of it, not remembering it when I finished. To me this kind of handicap is the worst to acknowledge as it’s a weakness other’s can barely understand nor show consideration for it. I’m really glad @ihadcancer adresses this issue as I think amongst all those strong social media cancer thrivers it’s a deficiency nobody wants to talk about… Thanks for that ❤ #Repost @ihadcancer (@get_repost) ・・・ Say it with us: “I am not using #chemobrain as an excuse!” ???? Do you agree with us that #ChemoBrainisReal? #chemofog #chemo #memoryloss #sideeffects #cognitiveimpairment #chemotherapy #survivors #PCCI #CRCI #brainfog #resilience #fear #pain #mentalhealth #invisible #disability #limited . 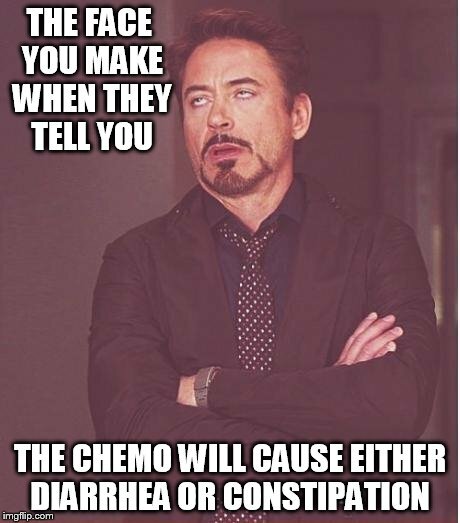 . . . .
#chemo had to meme it. Have a favorite meme? Let us know in the comments below.